Today is an update of my Inside Bench Perfect Skin Kit - Bench Perfect Skin Whitening Face Wash, Bench Perfect Skin Whitening Facial Toner, Bench Perfect Skin Whitening Facial Moisturizer and Bench Perfect Skin Whitening Facial Serum. I don't have the products anymore with me since I first use it back in 2014. One of the best habitI formed this 2017 is establishing a better skin care routine. I am proud to say that at my best skin condition at the moment. Going out with bare skin has never been a problem to me (except for brows, of course xoxo). A good lip and cheek tint like that of KJM in Bittersweet Magenta is enough to give me that natural glow that I need. Before, I was the laziest human being when it comes to taking care of my face. I will always procrastinate in removing my makeup before going to sleep. What helped me in developing the habit of cleansing, toning and moisturizing my face is using skincare sets. I’ve used the HimalayaHerbals Clear Complexion set December last year and currently I am using the AvonAnew 360° Illuminating Set. But back in 2014 I actually used, finished and fell in love with a Php 220 Bench Perfect Skin Whitening Kit. Yes! The kit sells for Php 220 only. Inside the simple yet eye-catchy box are four (4) full sized products namely the Bench Perfect Skin Whitening Face Wash, Bench Perfect Skin Whitening Facial Toner, Bench Perfect Skin Whitening Facial Moisturizer and Perfect Skin Whitening Face Serum. All are enriched with Vitamin C, Arbutin and Papaya Extract promising a whiter and healthier skin. The Bench Perfect Skin Whitening Facial Wash is equipped with Arbutin, Vitamin C and Avocado Oil for a whiter, more even skin tone and radiant complexion. This is ok to be used for All Skin Types. The full size is available for only 55pesos for 50 grams if you buy separately. A light and gentle facial wash that helps whiten skin while keeping your skin's natural moisture. Enriched with Arbutin, a whitening agent that optimizes and even out skin tone for visibly lighter and fairer skin. Contains Vitamin C, a powerful antioxidant that restores skin's radiance and natural glow. With Avocado Oil, known for its moisturizing and nourishing properties, it assists in the rejuvenation of the skin. Squeeze sufficient amount onto your palm. Lather with water water and massage onto your face. The Bench Perfect Skin Whitening Facial Wash is just like any regular face wash I’ve used. It has a nice foam into it and will definitely leave your skin feeling squeaky clean. This is a good everyday face wash you can use in the morning and at night. I don’t mind spending 55pesos for a transition face wash or something I can use in between the Avon Anew 360° Illuminating Face Wash. Though the product did not give much of the whitening effect, it still give a good 4 out of 5 stars. The price is so much awesome. It is built with nourishing ingredients like arbutin, Vitamin C and Avocado Oil in one. I love the refreshing smell which is not too strong but will definitely make you feel alive and energetic in every use. It also has these little bids which instantly goes deep in your skin, clearing your clogged pores. The Bench Perfect Skin Whitening Facial Wash can also be used as a makeup remover as it easily removes stubborn eye makeup and all. 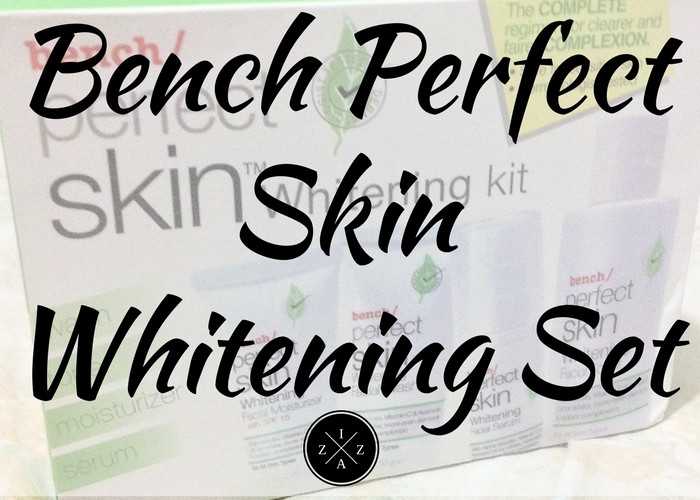 Something I like about this Bench Perfect Skin Whitening Set is it comes with a toner already. Toners are good to prep the skin for heavier and thicker skincare products like moisturizers or day creams. 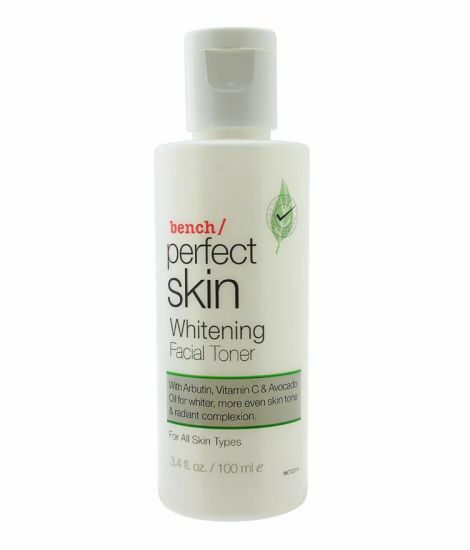 The Bench Perfect Skin Whitening Facial Toner also has Arbutin, Vitamin C and Avocado Oil for whiter, more even skin tone and radiant complexion. The full size can be bought for 49pesos only for 100 ml worth of product. A skin lightening toner that tightens pores and refines surface of the skin leaving it fresh and clear. Moisten a piece of cotton and apply to freshly cleansed face in circular motion. I personally believe in the power of toner and how it generally helps in balancing out the layer of the skin. This one is really soothing and although there may be alcohol in the ingredients, it is still mild and safe for daily use. Toning is recommended to do every morning and every night right after the washing the face and I find this Bench Perfect Skin Whitening Facial Toner as perfect combination. Aside from the whitening effect, it is also one of the reason why I am much confident to show off my face without makeup. The Bench Perfect Skin Whitening Facial Toner reminds me so much of the Belo Whitening Toner in Pink. The both have the same consistency and effect on the face. 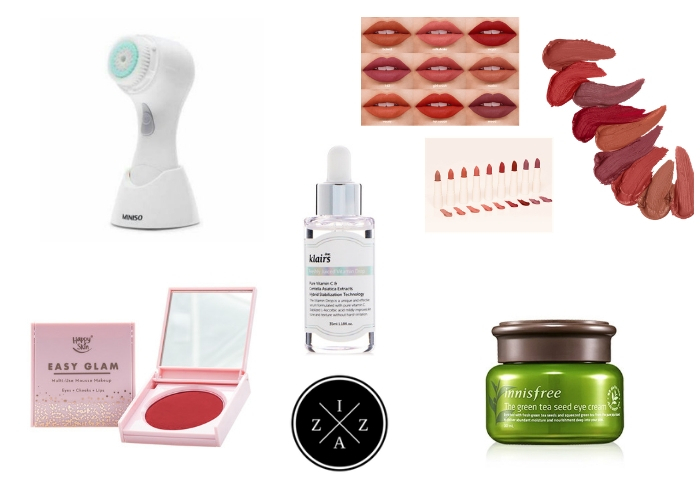 You will totally feel how the product cleanses your face. It also helps in minimizing the oiliness of my face. The smell is pretty enticing and my face feels clean and refreshed after use. I had my hits and misses when it comes to moisturizer. Been a big fan of the Celeteque Moisturizer which helped clear my skin during my TagiyawatBattle. When it comes to daytime moisturizer I love a product that can be easily absorbed by my skin. Unfortunately, the Bench Perfect Skin Whitening Facial Moisturizer doesn’t work the same. Still it has the same benefits of Arbutin, Vitamin C and Avocado Oil for whiter, more even skin tone and radiant complexion. 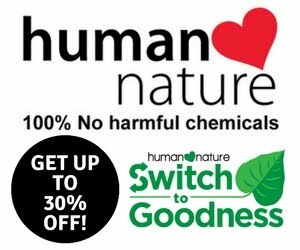 This is also the smallest of the four full-sized products and is available separately for 55pesos with 20 grams of product. A gentle facial moisturizer that helps whiten skin and reduces dark spots. It has SPF 15 that protects skin from harmful UV rays. With Avocado Oil, known for its moisturizing and nourishing properties, it assists in the rejuvination of the skin. Spread evenly and massage gently onto your face. Out of the four, this whitening facial moisturizer is my least favorite. It is actually unlike any facial moisturizer available today with a texture that resembles more of a sun screen. 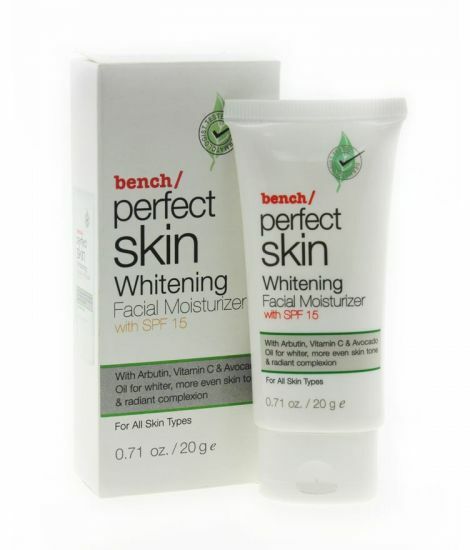 The Bench Perfect Skin Whitening Facial Moisturizer also does not hydrate that much and dries very fast into a matte finish. It will feel like you didn't put any moisturizer at all. It is however a good product to use as a makeup base. It doesn't leave you with the oily feeling on the face so you end up looking matte and fresh all day. This would probably be the cheapest serum available today. For just 149pesos you have almost 30 grams of product already. 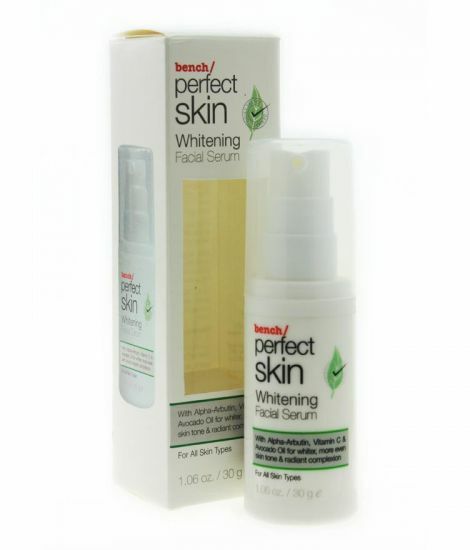 The Bench Perfect Skin Whitening Facial Serum is also enriched with Arbutin, Vitamin C and Avocado Oil for whiter, more even skin tone and radiant complexion. Serums are great for its very concentrated and has extra-nourishing ingredients inside that makes it work best in keeping a youthful and more radiant skin. A specially formulated moisturizing serum that helps whiten skin and reduce dark spots. Apply on freshly toned skin, spread evenly and massage gently onto skin. I love using the Bench Perfect Skin Whitening Facial Serum day and night for it gives the moisture that I needed and I wanted. It is also nice that Bench came up with an affordable serum which I believe is perfect for those who are frugal Pinays like me. I put this serum too on my neck area for it keeps it moisturized and helps minimize sagging. This Bench Perfect Skin Whitening Facial Serum is highly moisturizing and gives a dewy finch after use. Packaging-wise I appreciate that this serum comes with a pump for hygienic purposes. This product is very concentrated and super effective in brightening the skin tone. How I wish this is available in a bigger size, although a little goes a long way with this one. It is a great thing that Bench came out with their own skincare line. This Bench Perfect Skin Kit is very affordable for only 220pesos you already have four full-size products which will save you 89pesos. Each product is also very much OK to use for all skin types. It is good to know that apart from releasing affordable makeup line, Paintbox, Bench also invested in creating skincare products that could be the answer to all Filipina needs. The Bench Perfect Skin Whitening Facial Serum is the bomb! I also like the Bench Perfect Skin Whitening Facial Toner as well as the Facial Wash.